GBPJPY: The cross closed lower the past week leaving risk of more weakness on the cards. On the downside, support comes in at the 149.50 level where a violation will aim at the 149.00 level. A break below here will target the 148.50 level followed by the 148.00 level. Conversely, resistance is seen at the 150.50 level followed by the 151.00 level. A cut through that level will set the stage for a move further higher towards the 151.50 level. Further out, resistance resides at the 152.00 level. All in all, GBPJPY remains biased to the downside nearer term. USDCHF: The pair faces further downside pressure after it triggered a correction during early trading today. On the downside, support lies at the 0.9850 level. A turn below here will open the door for more weakness towards the 0.9800 level and then the 0.9750 level. On the upside, resistance resides at the 0.9950 level where a break will clear the way for more strength to occur towards the 1.0000 level. Further out, resistance comes in at the 1.0050 level. Above here if seen will turn attention to 1.0100. All in all, USDCHF faces further corrective pullback pressure. GOLD: The commodity faces further recovery higher as it eyes a move towards the 1,270.36 resistance zone. On the downside, support comes in at the 1,250.00 level where a break will turn attention to the 1,240.00 level. Further down, a cut through here will open the door for a move lower towards the 1,230.00 level. Below here if seen could trigger further downside pressure towards the 1,220.00 level. Conversely, resistance resides at the 1,270.00 level where a break will aim at the 1,280.00 level. A turn above there will expose the 1,290.00 level. Further out, resistance stands at the 1,300.00 level. Its daily RSI is bullish and pointing higher suggesting further strength. All in all, GOLD looks to strengthen further on correction. USDJPY: The pair may have hesitated on Thursday but still faces upside threats. On the downside, support lies at the 113.00 level where a break if seen will aim at the 112.50 level. A cut through here will turn focus to the 112.00 level and possibly lower towards the 111.50 level. On the upside, resistance resides at the 114.00 level. Further out, we envisage a possible move towards the 114.50 level. 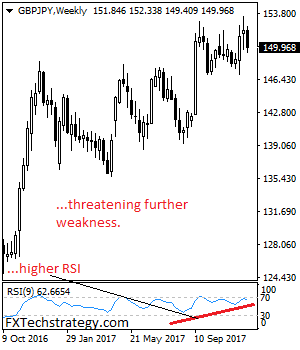 Further out, resistance resides at the 115.00 level with a turn above here aiming at the 115.50 level. 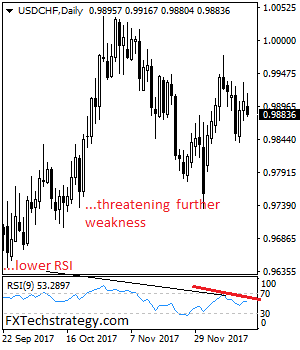 Its daily RSI is bearish and pointing higher suggesting more strength. On the whole, USDJPY faces further upside threats. USDCHF: The With the pair halting its weakness the past week, more strength is envisaged. On the downside, support lies at the 0.9850 level. A turn below here will open the door for more weakness towards the 0.9800 level and then the 0.9750 level. On the upside, resistance resides at the 0.9950 level where a break will clear the way for more strength to occur towards the 1.0000 level. Further out, resistance comes in at the 1.0050 level. Above here if seen will turn attention to 1.0100. All in all, USDCHF faces further corrective recovery pressure. GBPUSD: The pair extended its recovery higher on Thursday to open the door for more strength. Support lies at the 1.3400 level where a break will turn attention to the 1.3350 level. Further down, support lies at the 1.3300 level. Below here will set the stage for more weakness towards the 1.3250 level. Conversely, resistance stands at the 1.3500 levels with a turn above here allowing more strength to build up towards the 1.3550 level. Further out, resistance resides at the 1.3600 level followed by the 1.3650 level. 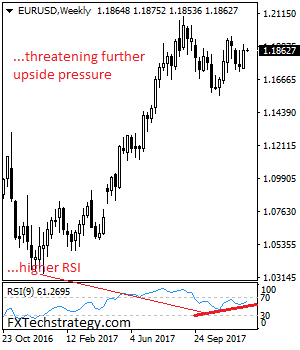 Its daily RSI is bullish and pointing higher suggesting further upside pressure. On the whole, GBPUSD looks to strength further. GOLD: The commodity still faces its broader upside pressure as it saw a rejection of lower prices on Thursday. On the downside, support comes in at the 1,300.00 level where a break will turn attention to the 1,290.00 level. Further down, a cut through here will open the door for a move lower towards the 1,280.00 level. Below here if seen could trigger further downside pressure towards the 1,270.00 level. Conversely, resistance resides at the 1,320.00 level where a break will aim at the 1,330.00 level. A turn above there will expose the 1,340.00 level. Further out, resistance stands at the 1,350.00 level. Its daily RSI is bullish and pointing higher suggesting further strength. All in all, GOLD looks to strengthen further. 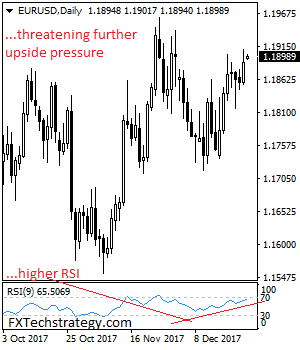 EURUSD: The pair continues to retain its upside pressure hesitating on Friday. On the upside, resistance comes in at 1.2050 level with a cut through here opening the door for more upside towards the 1.2100 level. Further up, resistance lies at the 1.2150 level where a break will expose the 1.2200 level. Conversely, support lies at the 1.1950 level where a violation will aim at the 1.1900 level. A break of here will aim at the 1.1850 level. Below here will open the door for more weakness towards the 1.1800. All in all, EURUSD faces further downside weakness on price halt. EURJPY: With the pair following through lower to decline further on Monday, more weakness is envisaged towards its key support located at 134.79. On the downside, support comes in at the 134.50 level where a break if seen will aim at the 134.00 level. A cut through here will turn focus to the 133.50 level and possibly lower towards the 133.00 level. On the upside, resistance resides at the 136.00 level. Further out, we envisage a possible move towards the 136.50 level. 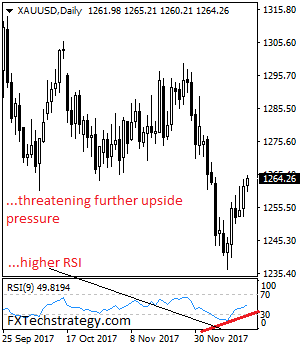 Further out, resistance resides at the 137.00 level with a turn above here aiming at the 137.50 level. On the whole, EURJPY faces further price weakness. USDJPY: The pair closed further lower on sell off on Wednesday. On the downside, support lies at the 111.00 level where a break if seen will aim at the 110.50 level. A cut through here will turn focus to the 110.00 level and possibly lower towards the 109.50 level. On the upside, resistance resides at the 112.00 level. Further out, we envisage a possible move towards the 112.50 level. 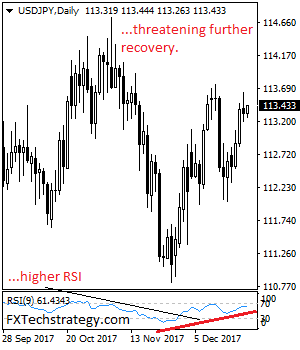 Further out, resistance resides at the 113.00 level with a turn above here aiming at the 113.50 level. On the whole, USDJPY faces further bearishness. GBPUSD: The pair faces further move higher as it builds up on its Thursday gain. Support lies at the 1.3600 level where a break will turn attention to the 1.3550 level. Further down, support lies at the 1.3500 level. Below here will set the stage for more weakness towards the 1.3450 level. Conversely, resistance stands at the 1.3650 levels with a turn above here allowing more strength to build up towards the 1.3700 level. Further out, resistance resides at the 1.3750 level followed by the 1.3800 level. On the whole, GBPUSD looks to move further higher in the days ahead. 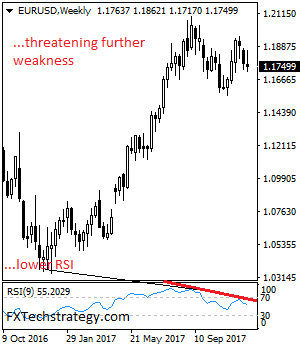 EURUSD: The pair closed higher the past week triggering the resumption of long term uptrend. On the upside, resistance comes in at 1.2250 level with a cut through here opening the door for more upside towards the 1.2300 level. Further up, resistance lies at the 1.2350 level where a break will expose the 1.2400 level. Conversely, support lies at the 1.2150 level where a violation will aim at the 1.2100 level. A break of here will aim at the 1.2050 level. Below here will open the door for more weakness towards the 1.2000. Its weekly RSI is bullish and pointing higher. All in all, EURUSD faces further upside weakness on further bullishness. e pressure as it was seen building up on its past gain during Monday trading session. Support lies at the 1.3750 level where a break will turn attention to the 1.3700 level. Further down, support lies at the 1.3650 level. Below here will set the stage for more weakness towards the 1.3600 level. Conversely, resistance stands at the 1.3800 levels with a turn above here allowing more strength to build up towards the 1.3850 level. 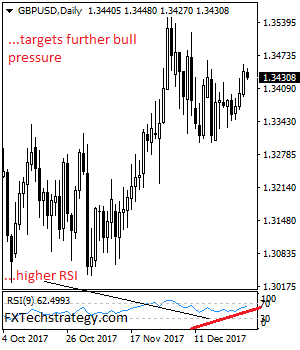 Further out, resistance resides at the 1.3900 level followed by the 1.3950 level. Its daily RSI is bullish and pointing higher suggesting further strength. On the whole, GBPUSD looks to move further higher on bull pressure. USDJPY: The pair closed further lower on Monday opening the door for more weakness. This view remains valid despite its present price hesitation. On the downside, support lies at the 110.00 level where a break if seen will aim at the 109.50 level. A cut through here will turn focus to the 109.00 level and possibly lower towards the 108.50 level. On the upside, resistance resides at the 111.00 level. Further out, we envisage a possible move towards the 111.50 level. Further out, resistance resides at the 112.00 level with a turn above here aiming at the 112.50 level. On the whole, USDJPY faces further bearishness. USDCHF: The pair halted its broader weakness on Wednesday leaving risk of more correction on the cards. On the downside, support lies at the 0.9650 level. A turn below here will open the door for more weakness towards the 0.9600 level and then the 0.9550 level. On the upside, resistance resides at the 0.9700 level where a break will clear the way for more strength to occur towards the 0.9750 level. 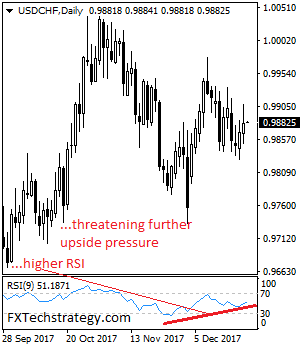 Further out, resistance comes in at the 0.9800 level. Above here if seen will turn attention to 0.9850. All in all, USDCHF faces further weakness short term but with caution of a recovery.